London awakes one morning to find itself besieged by a sky full of floating icebergs. Destroyed oil rigs, mysteriously reborn, clamber from the sea and onto the land, driven by an obscure but violent purpose. An anatomy student cuts open a cadaver to discover impossibly intricate designs carved into a corpse's bones—designs clearly present from birth, bearing mute testimony to . . . what? 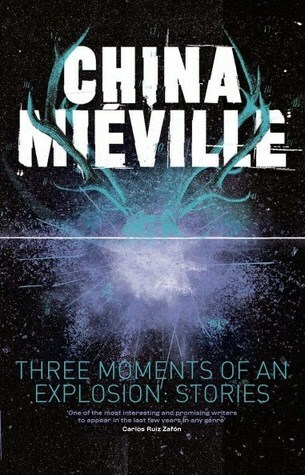 I received Three Moments of an Explosion: Stories through NetGalley in exchange for an honest review. I was so excited to receive this book as China Mieville is one of my favourite authors. That said, I am not a big fan of short stories. Just a couple months ago I finished reading my first book of short stories. Normally I start, then give up. I am pleased to say that I read every story in this book. There are well over 20 stories, some are very short while others are much longer. I have to say that I got on better with the longer ones. As with all short story collections I've attempted to read, this one has a number of stories where you are left at the end wondering what that was all about and wondering if you missed something. I had this feeling on quite a few occasions. Despite this confusion, I was also often left with a feeling of enjoyment. Some of my favourites in this collection were Polynia in which Icebergs appeared in the skies of London; The Dowager of Bees in which special cards would appear mysteriously during games of Poker with very interesting consequences; In the Slopes was set at an Archeological dig site where some strange findings are discovered; The Crawl, a Zombie movie trailer which I would definitely go to see if it were ever actually made in to a movie; Watching God, a post apocalyptic island set story where ships sit off the coast just watching; The Buzzards Egg about a guy that I really felt for who had to look after a captured God; Dreaded Outcome about a therapist who will go to the extreme to ensure her patients get well; and After the Festival which was very grim and disturbing that it game me goosebumps and made me shiver upon recounting the story to my partner. There was quite a mix of stories, all a little strange as one would expect with Mieville. He created some awesome worlds which I would love to spend more time in. I was left with lots of questions (which is not uncommon for me at the end of a short story) but I feel ok with that. I will definitely be reading his older short story collection Looking for Jake and Other Stories (as well as future novels).